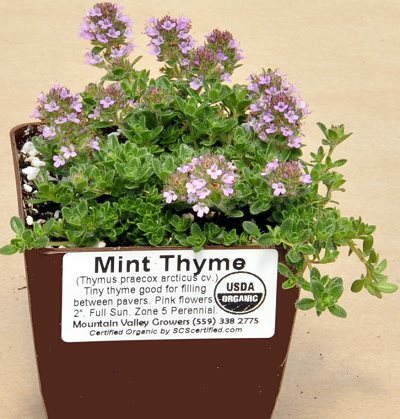 Mint Thyme is one of the thymes we most often recommend for planting between flagstones. The three mint thymes planted in the picture above each measure about six inches in diameter and are about three months old. They were planted in June and are quickly growing to fill in the space between the stones. After planting, they were mulched heavily with small ground bark to suppress weeds and conserve moisture. Watering well the first month or so is key to getting thymes to establish themselves quickly. Thymes have fairly shallow root systems so watering well during hot summer months is crucial to maintain a nice even green cover. While we love the way mint thyme looks, it does not have a fragrance and we have no idea why it was given this name. It is easy to see why this small low growing thyme is a favorite. It not only looks great when it is blooming in June but it also looks great when it is all green. The other thymes we like to use in between stepping stones are Annie Hall Thyme, Elfin Thyme, Highland Cream Thyme, Leprechaun Thyme, Pink Chintz Thyme, White Moss Thyme and Woolly Thyme. 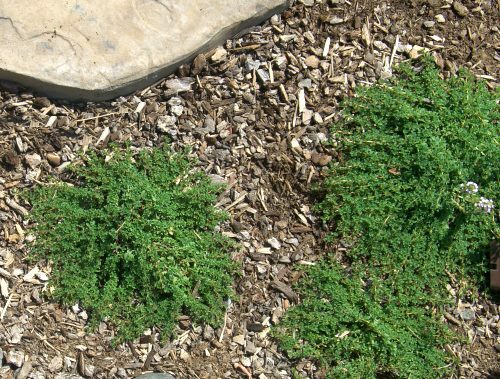 Mint Thyme is often included in our economical Flagstone Filler Assortment. This plant is often available in plug trays. These trays hold 128 of all the same plant. They are a great low cost way to fill a lot of space. Each cell is 3/4 of inch by an inch. Check here to see if Mint Thyme Plug Trays are available.